Luis Suarez ensured Barcelona did not lose any more ground on La Liga leaders Real Madrid by striking a second-half winner against Sevilla. The Uruguayan converted in the 61st minute from Lionel Messi's pass for his 95th goal in 112 Barcelona games. Vitolo gave Sevilla the lead when he slotted home in the 15th minute before Messi equalised from 18 yards. Barcelona now have 25 points from 11 games, just two behind Real, with Sevilla back on 21 points. Luis Enrique's Spanish champions created numerous chances after the break as they started to open up their opponent's defence. Sevilla keeper Sergio Rico made two good saves to keep his side in the game. He kept out a stinging effort from Croatian midfielder Ivan Rakitic and then tipped over a shot from Messi, who had received the ball from Suarez's sublime backheel volley. Suarez also produced another brilliant piece of skill when he rounded keeper Rico and then rolled the ball across the six-yard area. The ball eluded Messi, who had failed to read his team-mate's intentions. Sevilla were overawed in the second half but did go close when former Blackburn player Steven Nzonzi headed narrowly wide of Marc-Andre ter Stegen's left-hand upright. Match ends, Sevilla 1, Barcelona 2. Second Half ends, Sevilla 1, Barcelona 2. Javier Mascherano (Barcelona) is shown the yellow card for a bad foul. Foul by Javier Mascherano (Barcelona). Joaquín Correa (Sevilla) wins a free kick in the defensive half. Lionel Messi (Barcelona) wins a free kick on the right wing. Foul by Adil Rami (Sevilla). Luis Suárez (Barcelona) is shown the yellow card. Foul by Daniel Carriço (Sevilla). Foul by Luis Suárez (Barcelona). Adil Rami (Sevilla) wins a free kick in the defensive half. Substitution, Barcelona. Rafinha replaces Denis Suárez. Foul by André Gomes (Barcelona). Vitolo (Sevilla) wins a free kick in the defensive half. Daniel Carriço (Sevilla) is shown the yellow card for a bad foul. Substitution, Sevilla. Joaquín Correa replaces Pablo Sarabia. 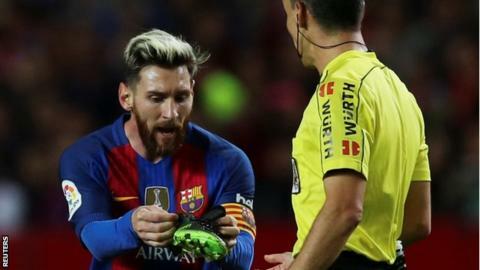 Lionel Messi (Barcelona) is shown the yellow card. Steven N'Zonzi (Sevilla) is shown the yellow card for a bad foul. Sergio Busquets (Barcelona) wins a free kick in the attacking half. Attempt saved. Vitolo (Sevilla) right footed shot from outside the box is saved in the bottom left corner. Attempt blocked. Adil Rami (Sevilla) header from very close range is blocked. Assisted by Pablo Sarabia with a cross. Corner, Sevilla. Conceded by Lucas Digne. Substitution, Sevilla. Vicente Iborra replaces Samir Nasri. Attempt missed. Samuel Umtiti (Barcelona) left footed shot from outside the box misses to the right. Attempt saved. Lionel Messi (Barcelona) header from the centre of the box is saved in the top left corner. Assisted by Neymar. Lionel Messi (Barcelona) wins a free kick in the attacking half. Corner, Barcelona. Conceded by Sergio Rico. Attempt saved. Luis Suárez (Barcelona) right footed shot from the centre of the box is saved in the centre of the goal. Assisted by Lionel Messi with a through ball. Attempt missed. Steven N'Zonzi (Sevilla) header from the centre of the box is close, but misses to the right. Assisted by Pablo Sarabia with a cross following a corner. Corner, Sevilla. Conceded by Sergi Roberto. Substitution, Barcelona. André Gomes replaces Ivan Rakitic.